Lol haha I love this !! haha… never mess with ‘the wife’ !! haha..never mess with ‘the wife’! womankind is loving the revenge huh ?? hahahaha !! well Indian women are smart !! Ah makes sense to me! The demands are never ends … the poor husband gets a beating anyhow … well depicted through you doodle .. which is always pointing to the day to day happening which we simply live with it ! That is an apt and appropriate proposition. Ha ha ha.you always have an add-on at home. 😀 haha true Sir !! 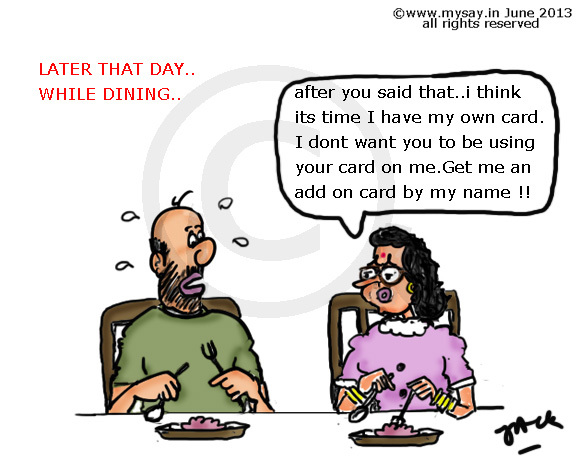 LOL That is what happens … smart wife who got a smart card? Ha ha that the follow up scene , very interesting. The point husband wanted to highlight was that he wanted more care , love and attention from the wife but instead she took it other way round. Being candid backfired in this case, well poor husband, he should have kept his mouth shut lol. Either way the husband pays up :). Sorry, but what IS an add on card? Feel a bit like a tubelight here. Haha I’m sharing this with my husband and a few other ‘sufferers’.